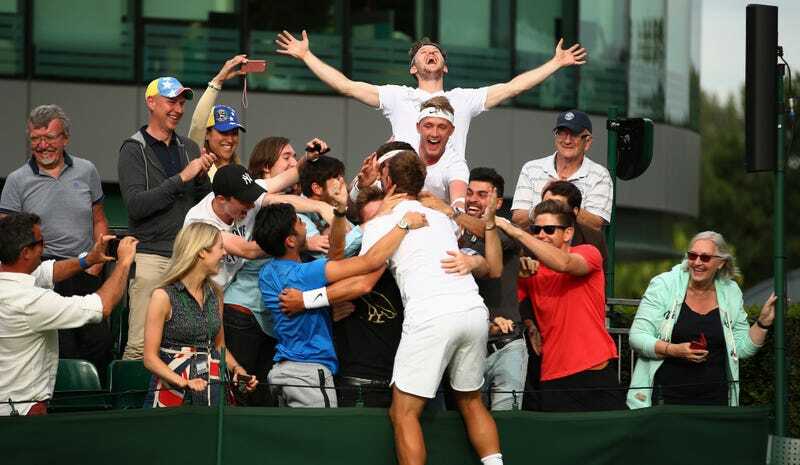 To get to the second round of the Wimbledon finals, Marcus Willis had to beat the 54th-ranked player in the world, the 99th, and also a pair of highly-touted Russian teenagers. If Willis wants to get to the third round, he’ll have to beat Roger Federer. This is fairly standard fare for most anyone who wants to make it through the qualifying rounds then make a run in the finals, but Willis’ path was particularly impressive since he decided to quit professional tennis in February, he was the very last man into the pre-qualifying wildcard draw, and he was ranked 775th in the world a week ago. With Bate’s encouragement, Willis rededicated himself to tennis, despite having endured injuries and financial hardships in recent years. In 2014, struggling with touring expenses, Willis had started a crowdfunding campaign seeking support in getting to his “childhood dream” tournament. Willis apparently still lives with his parents and his previous efforts to start up his career have been plagued by weight and discipline problems (he said he used to be an overweight loser and he’s inherited the unfortunate nickname “Cartman”). Very few players go from fringe Tunisian tournaments to months-long layoffs to the Wimbledon finals, and fewer still do anything once they get there. But this afternoon, Willis took down Ricardas Berankis in straight sets to raucous enthusiasm from the hometown crowd. Naturally they’re going to support him — rightfully so, because I think it’s a very cool story. I saw him play today. He plays well. Plus, he is serve and volleying, which I love to see. He came up with some great, great shots. To beat a guy of Berankis’ calibre in straight sets shows you how tough he is.